The effects of taping have been well documented with growing support in the literature. Since the 1890's taping has been advocated in the prevention and treatment of injuries. 'The Shoulder .....Whats New' course run by Jo Gibson was really useful for both learning new techniques and also fully understanding the reasons behind WHY we use them'. Jo is a Clinical Physiotherapy Specialist at the Liverpool Upper Limb Unit based at the Royal Liverpool Hospital, UK. She lectures both nationally and internationally about rehabilitation of the shoulder. Her research interests are shoulder instability and motor learning. Jo, Squad Physiotherapist for the Great Britain Endurance riding Team and co-author of the GOST booklet, a Guide for Orthopaedic Surgeons and Therapists regarding operative and postoperative management of Upper Limb Patients. Leanne has come back to clinic from the course armed with loads of up to the minute information for enhancing your response to physio treatment of those shoulder problems. If you are having problems with your shoulder...... even if you have tried treatment in the past, come an have an assessment. I am certain you will find our clinic's approach is something new. taping and strapping update and OMM ahead! Off to Gateshead this weekend to update on taping and strapping with ACPSM. Learning and revising new techniques is always a pleasure and never a chore! Preparation is complete for OMM ( Howgills ). Now we have a room to work some hands-on magic with the competitors on 27/28th October. Good Luck to all the people taking part in this gruelling challenge. We hope the weather picks up for you over the week! On with Olympic Challenges! Rifle shooting. A great fun challenge number 3 was completed by the physio team with close and accurate shooting by everyone! Orienteering was tough for us novices. The two courses set in and around Williamsons Park in Lancaster provided some tricky terrain in parts. The evening was a great success with thanks to SROC who really supported our fundraising efforts. Thanks guys! Well done to Mrs Anna Geary who came in ahead of the rest of our team! Hockey with Morecambe and District Hockey Club! Update on the challenge! I am a bit late updating this but the opening event for the Decathalon with a Difference got off to a great start with the hockey players we are more used to treating in clinic than charging around a hockey pitch battling against! A fantastic night which has inspired me to return to play after 25 years break ( I say play in the loosest sense of the word)! Thanks to all the players at Morecambe! Welcome to our Olympic Challenge! Go Team!!! As usual I am slightly slow on updates in the new year! So Happy New Year to you all! It has been a busy start to 2012 and clinics are full in all our locations. For those clients who currently travel from the outlying regions and valleys around Sedbergh and beyond we are really pleased to announce an extension to our current services at Sedbergh school. We will now also provide a private service for the general public from within the lovely new health centre meaning you can receive the highest standards of physiotherapy treatment without the long commutes. The clinics are expected to start in March as we move into the new health centre and you may notice a few new faces joining the team! We look forward to it! Leanne, Lyn and Alex have just got back from giving a talk to the WI at Yealand and what a great evening we had! Thank you to all the ladies who attended and we hope you got something out of the evening to take away and use! We thoroughly enjoyed the evening especially Lyn's excellent, informative talk on the pelvic floor! Thank you for the cheque for £35.00 which we will be splitting between our 2012 chosen charities. 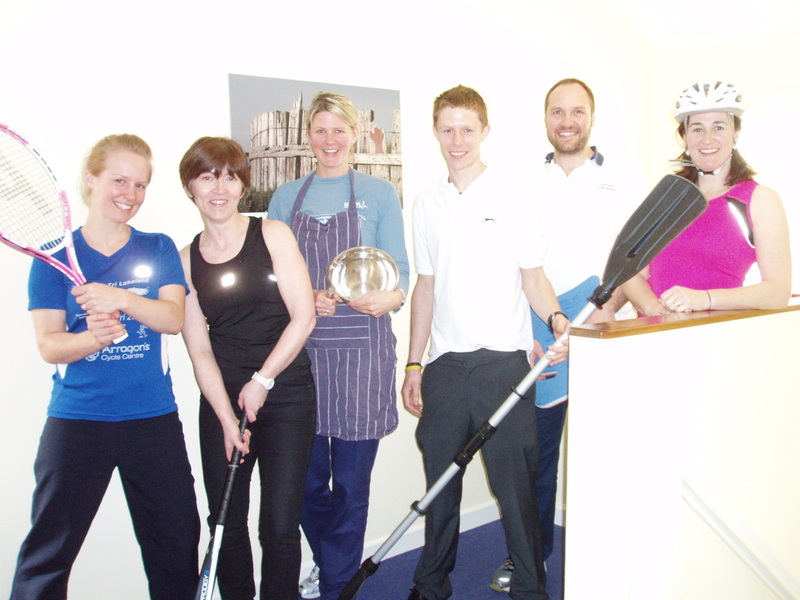 The physios and staff at the clinic have been bitten by the bug and have decided to set ourselves an Olympic Challenge. We will be taking part in our 'Decathalon with a Difference' and will be raising money for the charities listed below. Watch this space for further details and information on where, when and how you can donate. Charities we will be supporting in 2012...... We need your support! West End Impact is a local charity based in the West End of Morecambe. The charity provide a range of services including a drop in for those with many needs from homelessness, addiction or even just loneliness. They also have a youth club, and parent cafe and an art group. The Motor Neurone Disease Association is our second chosen charity. The Motor Neurone Disease Association is the only national charity in England, Wales and Northern Ireland that funds and promotes global research into the disease and provides support for people affected by MND. Screening for better performance in sport. This tool is really invaluable for sportsmen and women, from elite athletes to those who just want to keep fit. If you are getting recurrent injuries or injuries that just won't seem to fully resolve ( not necessarily in the same location ) then this service is definitely for you. I have been using a kinetic control approach to treatment for several years now and this new screening tool enhances the benefits of this approach even further. Using key movement testing weak links in the kinetic chain are identified and treated to prevent uncontrolled movement or poor movement patterns developing. This means less abnormal stress and strain on the muscles, ligaments and joints and less injury! We treat the weak links identified by using specific strategies of low or high load training depending on findings and can re-screen again after eight weeks to really see whether the new training strategy has paid off. Great if you want an objective measure of your physio progress! During the screening process we perform a series of movement tests and accurately assess how you move, whether you compensate in any way and whether you can achieve the set bench mark for that test. These results are then analysed and we provide an accurate rehab and training program to address high and low risk areas as well as giving you the go ahead to progress training safely. The results may really surprise you! If you really want to see whether your physio is effective then this is definitely for you. If you want to minimise injury and get back to training safely then this is for you! You can ring for further details or book and initial assessment with Alex on our central booking line 01524426964. Recently back from Nottingham conference armed with fresh knowledge for treating your musculo-skeletal problems and sports injuries. Speakers from across the globe including Shirley Saarmann, Linda Joy Lee, Jo Gibson and Professor Paul Hodges have all blown my mind with their amazing research and clinical developments within physiotherapy. One of the many interesting topics discussed was the importance of "touch" in treatment. In some quarters physiotherapy seems to be less about hands-on treatment now and more about a ship 'em in- ship 'em out approach, with a one size fits all approach for exercises. Not getting hands on often seems to be the norm and so the skills of feeling with our hands is being lost. Thank goodness that our physios do not subscribe to this approach but really value the power of "touch". ON LINE PHYSIOTHERAPY BOOKING SYSTEM GOES LIVE! Here at Morecambe Bay Physiotherapy you can now book your physiotherapy appointment on-line. The system will be going live on the 13th September 2009, but you can book ahead from today to make an appointment at a time that suits you. Why have we done this? Well, we are often very busy with clients during the day and cannot always get to the telephone straight away. We wanted to make it easier for private clients to make and change appointments on line, saving you time and inconvenience. If you are being referred through your employers scheme, or through a third party provider please contact the clinic or wait for us to contact you. Please let us know your feedback about the system using this page. Your comments help us to improve the quality of services. We will still require 24 hours notice if you need to cancel an appointment. If less notice is given you may incur the full cost of your session.